A research team led by scientists at the University of Nebraska-Lincoln (UNL) has provided the first direct evidence that an algae-infecting virus can invade and potentially replicate within some mammalian cells. Known as Acanthocystis turfacea chlorella virus 1, or ATCV-1, the pathogen is among a class of chloroviruses long believed to take up residence only in green algae. That thinking changed with a 2014 study from Johns Hopkins University and UNL that found gene sequences resembling those of ATCV-1 in throat swabs of human participants. The new study (“Response of mammalian macrophages to challenge with the Chlorovirus ATCV-1), published in the Journal of Virology, introduced ATCV-1 to macrophage cells that serve critical functions in the immune responses of mice, humans, and other mammals. By tagging the virus with fluorescent dye and assembling three-dimensional images of mouse cells, the authors determined that ATCV-1 successfully infiltrated them. The authors also measured a threefold increase in ATCV-1 within 24 hours of introducing the virus. The relatively modest spike nevertheless suggests that ATCV-1 can replicate within the macrophage cells, according to co-author David Dunigan, Ph.D. Though a few studies have documented viruses jumping from one biological kingdom to another, chloroviruses were previously thought to have a limited “host range” that stopped well short of the animal kingdom, said Dr. Dunigan. The macrophage cells underwent multiple changes characteristic of those breached by a virus, he continued. These changes eventually included a form of programmed death that virologists consider an innate “scorched earth” defense against the spread of viruses, which require living cells to survive and replicate. Before dying, the cells exhibited multiple signs of stress that tentatively support links to mild cognitive impairments first reported in the 2014 paper. The new study measured a post-viral rise in interleukin 6, which previous research has linked with diminished spatial learning and certain neurological diseases. The authors also reported an increase in nitric oxide, an important signaling molecule that has been associated with memory impairments when produced in excess. The 2014 investigation, which was initially designed to test the cognitive functioning of human participants, found that those with the ATCV-1 DNA performed slightly worse on measures of visual processing and visual motor speed. Mice inoculated with the virus showed similar deficits in memory and attention while navigating mazes. The 2014 paper further suggested that ATCV-1 altered the expression of more than 1,000 genes in the rodent hippocampus, an area of the brain tied to memory and spatial navigation. The new study’s authors are continuing their collaboration with Johns Hopkins in the hope of ultimately confirming whether and how the virus contributes to any cognitive deficits suggested by the initial studies. “It is still unclear whether the factors induced by the cell-based virus challenge could also be induced in the whole animal, and whether the induced factors cause cognitive impairments in the animal or the human,” said co-author Tom Petro, Ph.D., professor of microbiology and immunology at the University of Nebraska Medical Center. Dr. Dunigan said he and his colleagues are also searching for other cellular responses to ATCV-1 while investigating how these responses might drive systemic changes in mice. “A research team from Stanford University’s School of Medicine is now one step closer to uncovering a cancer treatment that could be applicable across the board in killing every kind of cancer tumor” (1). It appeared that their antibody-drug against the CD47 protein, enabled the shrinking of all tumor cells. After completing their animal studies the researchers now move into a human phase clinical trials. CD47 has been previously studied and evaluated for its role in multiple cells, some of this data however, is somewhat controversy. So where do we stand? CD47 (originally named integrin-associated protein (IAP)) is a cell surface protein of the immunoglobulin (Ig) superfamily, which is heavily glycosylated and expressed by virtually all cells in the body and overexpressed in many types of cancer including breast, ovarian, colon, prostate and others (3). CD47 was first recognized as a 50 kDa protein associated and copurified with the Alpha-v-Beta-3 integrin in placenta and neutrophil granulocytes and later shown to have the capacity to regulate integrin function and the responsiveness of leukocytes to RGD-containing extracellular matrix proteins. CD47 has also been shown to be identical to the OA-3/OVTL3 antigen highly expressed on most ovarian carcinomas (4,5). CD47 consists of an extracellular IgV domain, a five times transmembrane-spanning domain, and a short alternatively spliced cytoplasmic tail. In both humans and mice, the cytoplasmic tail can be found as four different splice isoforms ranging from 4 to 36 amino acids, showing different tissue expression patterns (3). Thrombospondin-1 (TSP-1) – a secreted glycoprotein that plays a role in vascular development and angiogenesis. Binding of TSP-1 to CD47 influences several fundamental cellular functions including cell migration and adhesion, cell proliferation or apoptosis, and plays a role in the regulation of angiogenesis and inflammation. Signal-regulatory protein-alpha (SIRPα) – an inhibitory transmembrane receptor present on myeloid cells. The CD47/SIRPα interaction leads to bidirectional signaling, resulting in different cell-to-cell responses including inhibition of phagocytosis, stimulation of cell-cell fusion, and T-cell activation. 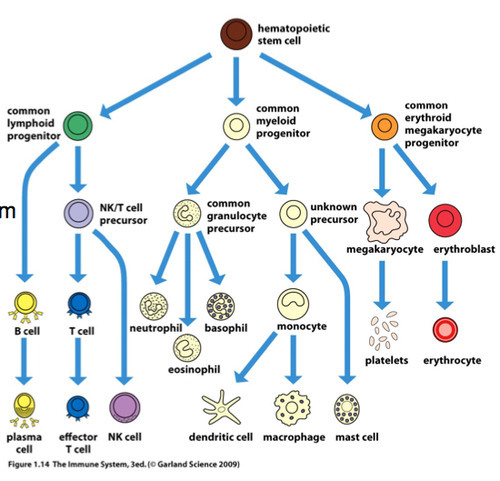 Cell proliferation – cell proliferation is heavily dependent on cell type as both activation and loss of CD47 can result in enhanced proliferation. For example, activation of CD47 with TSP-1 in wild-type cells inhibits proliferation and reduces expression of stem cell transcription factors. In cancer cells however, activation of CD47 with TSP-1 increases proliferation of human U87 and U373 astrocytoma. it is likely that CD47 promotes proliferation via the PI3K/Akt pathway in cancerous cells but not normal cells (7). Loss of CD47 allows sustained proliferation of primary murine endothelial cells and enables these cells to spontaneously reprogram to form multipotent embryoid body-like clusters (8). Apoptosis – Ligation of CD47 by anti-CD47 mAbs was found to induce apoptosis in a number of different cell types (3). For example: Of the two SIRP-family members known to bind the CD47 IgV domain (SIRPα and SIRPγ), SIRPα as a soluble Fc-fusion protein does not induce CD47-dependent apoptosis, hile SIRPα or SIRPγ bound onto the surface of beads induces apoptosis through CD47 in Jurkat T cells and the myelomonocytic cell line U937. Migration – CD47 role on cell migration was first demonstrated in neutrophils, these effects were shown to be dependent on avb3 integrins, which interact with and are activated by CD47 at the plasma membrane. In cancer, Blocking CD47 function has been shown to inhibit migration and metastasis in a variety of tumor models. 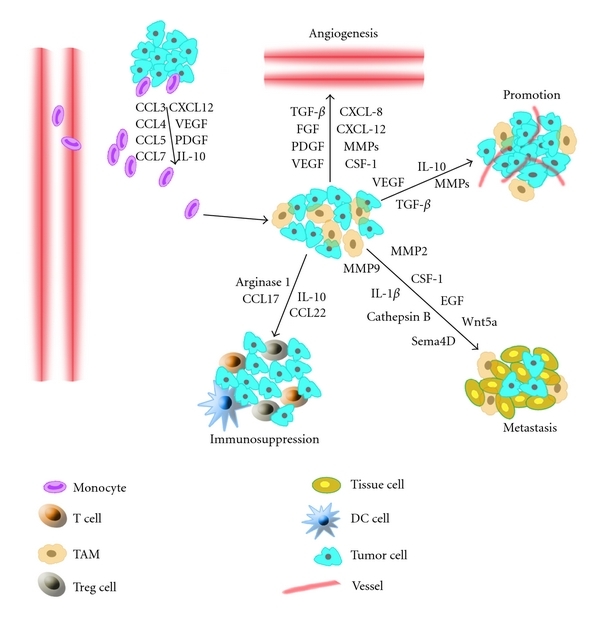 Blockade of CD47 by neutralizing antibodies reduced migration and chemotaxis in response to collagen IV in melanoma, prostate cancer and ovarian cancer-derived cells (9). Inflammatory response – Interactions between endothelial cell CD47 and leukocyte SIRPγ regulate T cell transendothelial migration (TEM) at sites of inflammation. CD47 also functions as a marker of self on murine red blood cells which allows RBC to avoid phagocytosis. Tumor cells can also evade macrophage phagocytosis through the expression of CD47 (2, 13). It appears that CD47 ligation induce different responses, depending on cell type and partner for ligation. CD47 is overexpressed in many types of human cancers and its known function as a “don’t eat me” signal, suggests the potential for targeting the CD47-SIRPα pathway as a common therapy for human malignancies (2,13). Upregulation of CD47 expression in human cancers also appears to influence tumor growth and dissemination. First, increased expression of CD47 in several hematologic malignancies was found to be associated with a worse clinical prognosis, and in ALL to predict refractoriness to standard chemotherapies (13, 14-16). Second, CD47 was demonstrated to regulate tumor metastasis and dissemination in both MM and NHL (13, 17). Efforts have been made to develop therapies inhibiting the CD47-SIRPα pathway, principally through blocking monoclonal antibodies directed against CD47, but also possibly with a recombinant SIRPα protein that can also bind and block CD47. While monotherapies targeting CD47 were efficacious in several pre-clinical tumor models, combination strategies involving inhibition of the CD47-SIRPα pathway offer even greater therapeutic potential. Specifically, antibodies targeting CD47-SIRPα can be included in combination therapies with other therapeutic antibodies, macrophage-enhancing agents, chemo-radiation therapy, or as an adjuvant therapy to inhibit metastasis (13). More so, chemo-radiation therapy-mediated upregulation of cell surface calreticulin may potentially augment the activity of anti-CD47 antibody. However, this approach may also lead to increased toxicity as cell surface calreticulin is expressed on non-cancerous cells undergoing apoptosis, a principle effect of chemo-radiation therapy (19). Evasion of immune recognition is a major mechanism by which cancers establish and propagate disease. Recent data has demonstrated that the innate immune system plays a key role in modulating tumor phagocytosis through the CD47-SIRPα pathway. Careful development of reagents that can block the CD47/SIRPα interaction may indeed be useful to treat many forms of cancer without having too much of a negative side effect in terms of inducing clearance of host cells. Therapeutic approaches inhibiting this pathway have demonstrated significant efficacy, leading to the reduction and elimination of multiple tumor types. Dr. Weissman says: “We are now hopeful that the first human clinical trials of anti-CD47 antibody will take place at Stanford in mid-2014, if all goes well. Clinical trials may also be done in the United Kingdom”. These clinical trials must be designed so that the data they generate will produce a valid scientific result!!! AIDS was first reported in 1981 followed by the identification of HIV as the cause of the disease in 1983 and is now a global pandemic that has become the leading infectious killer of adults worldwide. By 2006, more than 65 million people had been infected with the HIV virus worldwide and 25 million had died of AIDS (Merson MH. The HIV-AIDS pandemic at 25 – the global response. (1, 2). This has caused tremendous social and economic damage worldwide, with developing countries, particularly Sub-Saharan Africa, heavily affected. A cure for HIV/AIDS has been elusive in almost 30 years of research. Early treatments focused on antiretroviral drugs that were effective only to a certain degree. The first drug, zidovudine, was approved by the US FDA in 1987, leading to the approval of a total of 25 drugs to date, many of which are also available in fixed-dose combinations and generic formulations for use in resource-limited settings (to date, only zidovudine and didanosine are available as true generics in the USA). However, it was the advent of a class of drugs known as protease inhibitors and the introduction of triple-drug therapy in the mid-1990s that revolutionized HIV/AIDS treatment (3,4). This launched the era of highly active antiretroviral therapy (HAART), where a combination of three or more different classes of drugs are administered simultaneously. HIV resides in latent cellular and anatomical reservoirs where current drugs are unable to completely eradicate the virus. Macrophages are major cellular reservoirs, which also contribute to the generation of elusive mutant viral genotypes by serving as the host for viral genetic recombination. Anatomical latent reservoirs include secondary lymphoid tissue, testes, liver, kidney, lungs, the gut and the brain. The major challenge facing current drug regimens is that they do not fully eramacrdicate the virus from these reservoirs; requiring patients take medications for life. Under current treatment, pills are taken daily, resulting in problems of patient adherence. The drugs also have side effects and in some people the virus develops resistance against certain drugs. The use of the HAART regimen, particularly in the developed world, has resulted in tremendous success in improving the expectancy and quality of lives for patients. However, some HAART regimens have serious side effects and, in all cases, HAART has to be taken for a lifetime, with daily dosing of one or more pills. Due to the need to take the medication daily for a lifetime, patients fail to adhere to the treatment schedule, leading to ineffective drug levels in the body and rebound of viral replication.Some patients also develop resistance to certain combinations of drugs, resulting in failure of the treatment. The absence of complete cure under current treatment underscores the great need for continued efforts in seeking innovative approaches for treatment of HIV/AIDS. Drug resistance is mainly caused by the high genetic diversity of HIV-1 and the continuous mutation it undergoes. This problem is being addressed with individualized therapy, whereby resistance testing is performed to select a combination of drugs that is most effective for each patient (5). In addition, side effects due to toxicities of the drugs are also a concern. There are reports that patients taking HAART experience increased rates of heart disease, diabetes, liver disease, cancer and accelerated aging. Most experts agree that these effects could be due to the HIV infection itself or co-infection with another virus, such as co-infection with hepatitis C virus resulting in liver disease. However, the toxicities resulting from the drugs used in HAART could also contribute to these effects. Under current treatment, complete eradication of the virus from the body has not been possible. The major cause for this is that the virus resides in ‘latent reservoirs’ within memory CD4+ T cells and cells of the macrophage–monocyte lineage. A major study recently found that, in addition to acting as latent reservoirs, macrophages significantly contribute to the generation of elusive mutant viral genotypes by serving as the host for viral genetic recombination (6). The cells that harbor latent HIV are typically concentrated in specific anatomic sites, such as secondary lymphoid tissue, testes, liver, kidney, lungs, gut and the CNS. The eradication of the virus from such reservoirs is critical to the effective long-term treatment of HIV/AIDS patients. Therefore, there is a great need to explore new approaches for developing nontoxic, lower-dosage treatment modalities that provide more sustained dosing coverage and effectively eradicate the virus from the reservoirs, avoiding the need for lifetime treatments. The use of nanotechnology platforms for delivery of drugs is revolutionizing medicine in many areas of disease treatment. Nanotechnology-based platforms for systemic delivery of antiretroviral drugs could have similar advantages. Controlled-release delivery systems can enhance their half-lives, keeping them in circulation at therapeutic concentrations for longer periods of time. This could have major implications in improving adherence to the drugs. Moreover, by controlling the release profiles of the delivery systems, drugs could be released over a longer time and at higher effective doses to the specific targets. Figure 1. Various nanoscale drug delivery systems. The use of nanotechnology systems for delivery of antiretroviral drugs has been extensively reviewed by Nowacek et al. and Amiji et al. (7,8). In a recent study based on polymeric systems, nanosuspensions (200 nm) of the drug rilpivirine (TMC278) stabilized by polyethylene. A series of experiments by Dou et al. showed that nanosuspension of the drug indinavir can be stabilized by a surfactant system comprised of Lipoid E80 for effective delivery to various tissues. The indinavir nanosuspensions were loaded into macrophages and their uptake was investigated. Macrophages loaded with indinavir nanosuspensions were then injected intravenously into mice, resulting in a high distribution in the lungs, liver and spleen. 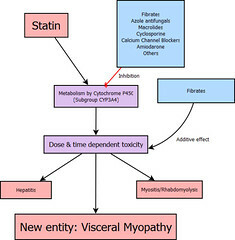 More significantly, the intravenous administration of a single dose of the nanoparticle-loaded macrophages in a rodent mouse model of HIV brain infection resulted in significant antiviral activity in the brain and produced measureable drug levels in the blood up to 14 days post-treatment.polypropylene glycol (poloxamer 338) and PEGylated tocopheryl succinate ester (TPGS 1000) were studied in dogs and mice. A single-dose administration of the drug in nanosuspensions resulted in sustained release over 3 months in dogs and 3 weeks in mice, compared with a half-life of 38 h for free drug. These results serve as a proof-of-concept that nanoscale drug delivery may potentially lower dosing frequency and improve adherence. Active targeting strategies have also been employed for antiretroviral drug delivery. 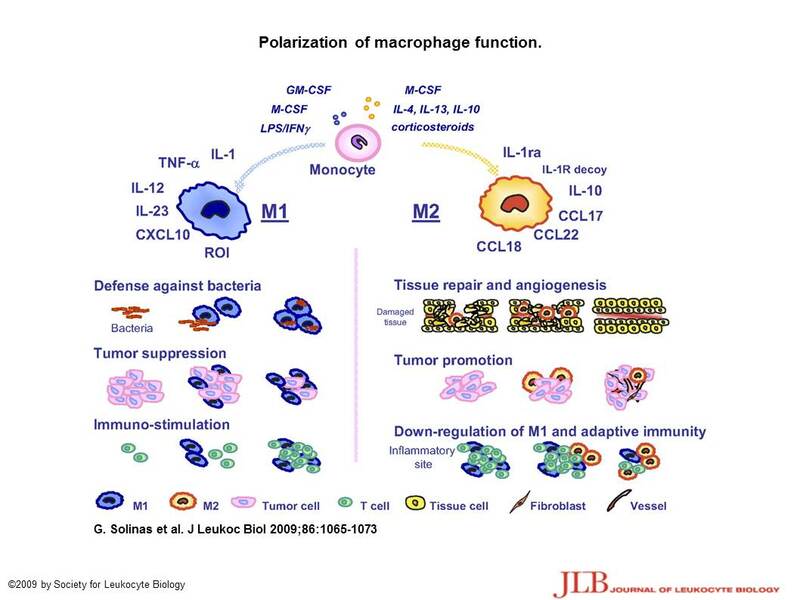 Macrophages, which are the major HIV reservoir cells, have various receptors on their surface such as formyl peptide, mannose, galactose and Fc receptors, which could be utilized for receptor-mediated internalization. The drug stavudine was encapsulated using various liposomes (120–200 nm) conjugated with mannose and galactose, resulting in increased cellular uptake compared with free drug or plain liposomes, and generating significant level of the drug in liver, spleen and lungs. Stavudine is a water-soluble drug with a very short serum half-life (1 h). Hence, the increased cellular uptake and sustained release in the tissues afforded by targeted liposomes is a major improvement compared with free drug. 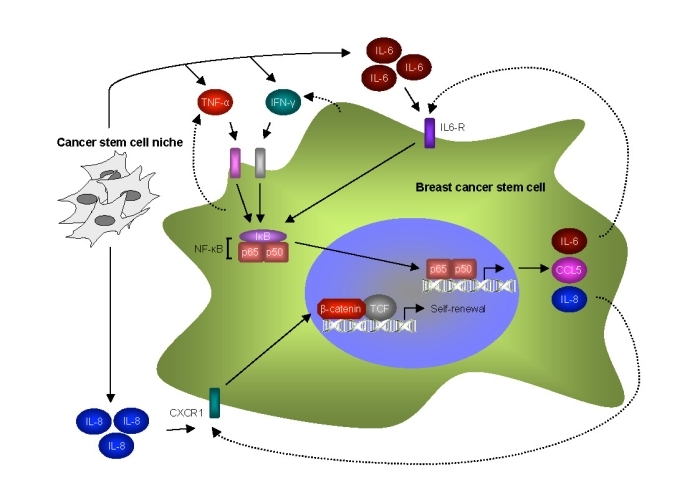 The drug zidovudine, with half-life of 1 h and low solubility, was also encapsulated in a mannose-targeted liposome made from stearylamine, showing increased localization in lymph node and spleen. An important factor to consider here is that although most of the nucleoside drugs such as stavudine and zidovudine have short serum half-lives, the clinically relevant half-life is that of the intracellular triphosphate form of the drug. For example, despite zidovudine’s 1 h half-life in plasma, it is dosed twice daily based on intracellular pharmacokinetic and clinical efficacy data. Therefore, future nanotechnology-based delivery systems will have to focus in showing significant increase of the half-lives of the encapsulated drugs to achieve a less frequent dosing such as once weekly, once-monthly or even less. In addition to improving existing antiretroviral therapy, there are ongoing efforts to discover alternative approaches for treatment of HIV/AIDS. One promising alternative approach is gene therapy, in which a gene is inserted into a cell to interfere with viral infection or replication. Other nucleic acid-based compounds, such as DNA, siRNA, RNA decoys, ribozymes and aptamers or protein-based agents such as fusion inhibitors and zinc-finger nucleases can also be used to interfere with viral replication. he mRNA of the gene of interest. For HIV/AIDS, RNAi can either target the various stages of the viral replication cycle or various cellular targets involved in viral infection such as CD4, CCR5, and/or CXCR4, the major cell surface co-receptors responsible for viral entry. HIV replicates by reverse transcription to form DNA and uses the DNA to produce copies of its mRNA for protein synthesis; siRNA therapy could be used to knock down this viral mRNA. As with other gene therapy techniques, delivery of siRNA to specific cells and tissues has been the major challenge in realizing the potential of RNAi. New nanotechnology platforms are tackling this problem by providing nonviral alternatives for effective and safe delivery. The first nontargeted delivery of siRNA in humans via self-assembling, cyclodextrin polymer-based nanoparticles for cancer treatment have recently entered Phase I clinical trials. Although at an early stage, nonviral delivery of siRNA for treatment of HIV infection is also gaining ground. A fusion protein, with a peptide transduction domain and a double stranded RNA-binding domain, was used to encapsulate and deliver siRNA to T cells in vivo. CD4- and CD8-specific siRNA delivery caused RNAi responses with no adverse effects such as cyto-toxicity or immune stimulation. Similarly, a protamine-antibody fusion protein-based siRNA delivery demonstrated that siRNA knockdown of the gag gene can inhibit HIV replication in primary T cells. Single-walled nanotubes were shown to deliver CXCR4 and CD4 specific siRNA to human T cells and peripheral blood mononuclear cells. Up to 90% knockdown of CXCR4 receptors and up to 60% knockdown of CD4 expression on T cells was observed while the knockdown of CXCR4 receptors on peripheral blood mononuclear cells was as high as 60%. In a separate study, amino-terminated carbosilane dendrimers (with interior carbon-silicon bonds) were used for delivery of siRNA to HIV-infected lymphocytes. These pioneering studies demonstrate that nonviral siRNA delivery is possible for HIV/AIDS treatment. However, more work needs to be done in optimizing the delivery systems and utilizing designs for efficient targeting and intracellular delivery. The recent developments in polymer- and liposome-based siRNA delivery systems could be optimized for targeting cells that are infected with HIV, such as T cells and macrophages. Moreover, since HIV mutates and has multiple strains with different genetic sequences, combination siRNA therapy targeting multiple genes should be pursued. For these applications, nanotechnology platforms with capability for co-delivery and targeting need to be developed specifically for HIV-susceptible cells. A macrophage and T-cell-targeted and nanotechnology-based combination gene therapy may be a promising platform for efficient HIV/AIDS treatment. The various treatment approaches described above focus on treating HIV/AIDS by directly targeting HIV at the level of the host cell or the virus itself. An alternative approach is immunotherapy aimed at modulating the immune response against HIV. CD8+ cytotoxic T-cell responses to acute HIV infection appear to be relatively normal, while neutralizing antibody production by B cells is delayed or even absent. Immunotherapy is a treatment approach involving the use of immunomodulatory agents to modulate the immune response against a disease. Similar to vaccines, it is based on immunization of individuals with various immunologic formulations; however, the purpose is to treat HIV-infected patients as opposed to protect healthy individuals (preventive vaccines will be discussed in an upcoming section). The various immunotherapy approaches for HIV/AIDS could be based on delivering cytokines (such as IL-2, IL-7 and IL-15) or antigens. The development of cellular immunity, and to a large degree humoral immunity, requires antigen-presenting cells (APCs) to process and present antigens to CD4+and CD8+ T cells. Dendritic cells (DCs) are the quintessential professional APCs responsible for initiating and orchestrating the development of cellular and humoral (antibody) immunity. Various polymeric systems have been explored for in vivo targeting of DCs and delivery of small molecules, proteins or DNAs showing potential for immunotherapy. Poly(ethylene glycol) (PEG) stabilized poly(propylene sulfide) polymer nanoparticles accumulated in DCs in lymph nodes. Following nanoparticle injection, DCs containing nanoparticles accumulated in lymph nodes, peaking at 4 days with 40–50% of DCs and other APCs having internalized nanoparticles. 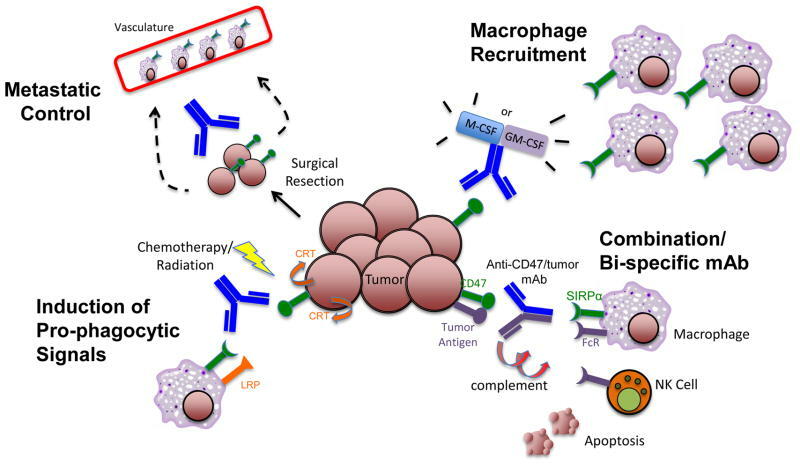 In another study, nanoparticles of the copolymer poly(D,L-lacticide-co-glycolide) (PLGA) showed efficient delivery of antigens to murine bone marrow-derived DCs in vitro, suggesting their potential use in immunotherapy. More recently, a very interesting work showed that HIV p24 protein adsorbed on the surface of surfactant-free anionic poly(D,L-lactide) (PLA) nanoparticles were efficiently taken-up by mouse DCs, inducing DC maturation. he p24-nanoparticles induced enhanced cellular and mucosal immune responses in mice. Although this targeting is seen in ex vivo-generated DCs and not in vivo DCs, the efficient delivery of the antigen to DCs through the nanoparticles is an important demonstration that may eventually be applied to in vivo DC targeting. he most clinically advanced application of nanotechnology for immunotherapy of HIV/AIDS is the DermaVir patch that has reached Phase II clinical trials (9). DermaVir is a targeted nanoparticle system based on polyethyleimine mannose (PEIm), glucose and HIV antigen coding DNA plasmid formulated into nanoparticles (~100 nm) and administered under a patch after a skin preparation. The nanoparticles are delivered to epidermal Langerhans cells that trap the nanoparticles and mature to become highly immunogenic on their way to the lymph nodes. Mature DCs containing the nanoparticles present antigens to T cells inducing cellular immunity. Preclinical studies and Phase I clinical trials showed safety and tolerability of the DermaVir patch, which led the progression to Phase II trials. This is the first nanotechnology-based immunotherapy for HIV/AIDS that has reached the clinic and encourages further work in this area. Summary of nanotechnology-based treatment approaches for HIV/AIDS. Note: to open the references in the table 1, please go to ref 1 in this post to see full ref info. The search for a safe and effective HIV/AIDS vaccine has been challenging in the almost three decades since the discovery of the disease. Recently, high-profile clinical trial failures have prompted great debate over the vaccine research, with some suggesting the need for a major focus on fundamental research, with fewer efforts on clinical trials. The major challenges in the development of a preventive HIV/AIDS vaccine have been the extensive viral strain and sequence diversity, viral evasion of humoral and cellular immune responses, coupled with the lack of methods to elicit broadly reactive neutralizing antibodies and cytotoxic T cells. The challenge associated with delivery of any exogenous antigen (such as nanoparticles) to APCs, is that exogenous antigens require specialized ‘cross-presentation’ in order to be presented by MHC class I and activate CD8+cytotoxic T cells. his requirement for cytosolic delivery of antigens and cross-presentation represents yet another hurdle for HIV intracellular antigen vaccine, but potentially an advantage of nanodelivery. Humoral responses (neutralizing antibodies produced by B cells) are generated to intact antigen presented on the surface for the virus, or nanoparticles, but these humoral responses typically require ‘help’ from CD4+ T cells, but rather both. Nanoparticles have potential as adjuvants and delivery systems for vaccines. Table 2 present the different approaches. Summary of nanotechnology developments for prevention of HIV/AIDS. ODN: Oligonucleotides; PLA: Poly(D,L-lactide); PLGA: Poly(D,L-lacticide-co-glycolide). Note: to open the references in the table 2, please go to ref 1 in this post to see full ref info. Nanotechnology can impact the treatment and prevention of HIV/AIDS with various innovative approaches. Treatment options may be improved using nanotechnology platforms for delivery of antiretroviral drugs. Controlled and sustained release of the drugs could improve patient adherence to drug regimens, increasing treatment effectiveness. While there is exciting potential for nanomedicine in the treatment of HIV/AIDS, challenges remain to be overcome before the potential is realized. These include toxicity of nanomaterials, stability of nanoparticles in physiological conditions and their scalability for large-scale production. These are challenges general to all areas of nanomedicine and various works are underway to tackle them. Another important consideration in investigating nanotechnology-based systems for HIV/AIDS is the economic aspect, as the hardest hit and most vulnerable populations reside in underdeveloped and economically poor countries. In the case of antiretroviral therapy, nanotherapeutics may increase the overall cost of treatment, reducing the overall value. However, if the nanotherapeutics could improve patient adherence by reducing dosing frequency as expected, and furthermore, if they can eradicate viral reservoirs leading to a sterile immunity, these advantages may effectively offset the added cost. 1. Mamo T, Moseman EA., Kolishetti N., Salvadoe-Morales C., Shi J., Kuritzkes DR., Langer R., von-Adrian U and Farokhzad OF. 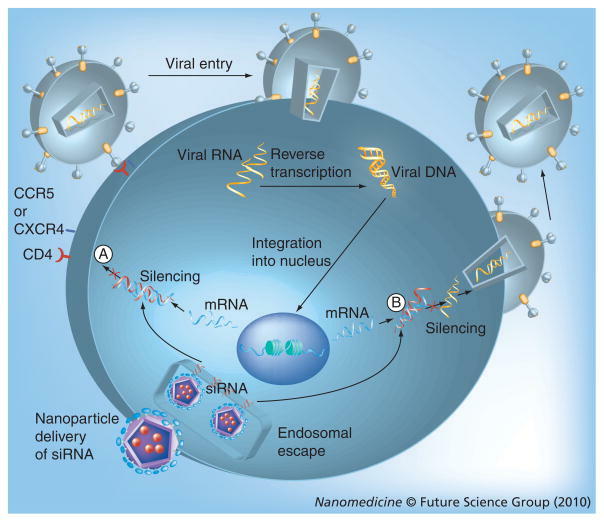 Emerging nanotechnology approaches for HIV/AIDS treatment and prevention. 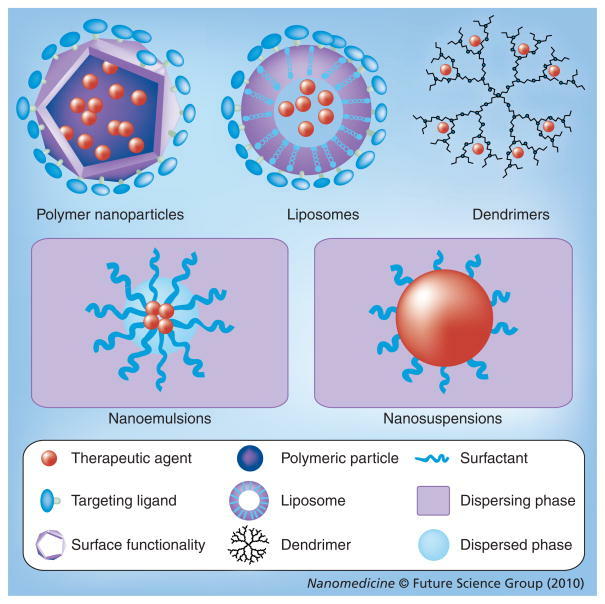 Nanomedicine (Lond) 2010; 5(2): 269-295. 5.Sax PE, Cohen CJ, Kuritzkes DR. HIV Essentials. Physicians’ Press; Royal Oak, MI, USA: 2007. 6. Lamers SL, Salemi M, Galligan DC, et al. Extensive HIV-1 intra-host recombination is common in tissues with abnormal histopathology. PLoS One. 2009;4(3):E5065. 7. Vyas TK, Shah L, Amiji MM. Nanoparticulate drug carriers for delivery of HIV/AIDS therapy to viral reservoir sites. Expert Opin Drug Deliv. 2006;3(5):613–628. This post is in continuation to Part 1 by the same title. In part one I covered the basics of role of redox chemistry in immune reactions, the phagosome cauldron, and how bacteria bacteria, virus and parasites trigger the complex pathway of NO production and its downstream effects. While we move further in this post, the previous post can be accessed here. In addition to eradicating pathogens, NO/RNS and ROS and their chemical interactions act as effective immunomodulators that regulate many cellular metabolic pathways and tissue repair and proinflammatory pathways. Figure 3 shows these pathways. Regulation of iNOS enzyme activity is critical to NO production. Factors such as the availability of arginine, BH4, NADPH, and superoxide affect iNOS activity and thus NO production. In the absence of arginine and BH4 iNOS becomes a O2_/H2O2 generator (Vásquez-Vivar et al., 1999). Hence metabolic pathways that control arginine and BH4 play a role in determining the NO/superoxide balance. Arginine levels in cells depend on various factors such as type of uptake mechanisms that determine its spatial presence in various compartments and enzymatic systems. As shown in Fig3 Arginine is the sole substrate for iNOS and arginase. Arginase is another key enzyme in immunemodulation. AG is also regulated by NOS and NOX activities. NOHA, a product of NOS, inhibits AG, and O2–increases AG activity. Importantly, high AG activity is associated with elevated ROS and low NO fluxes. NO antagonises NOX2 assembly that in turn leads to reduction in O2_ production. NO also inhibits COX2 activity thus reducing ROS production. Thus, as NO levels decline, oxidative mechanisms increase. 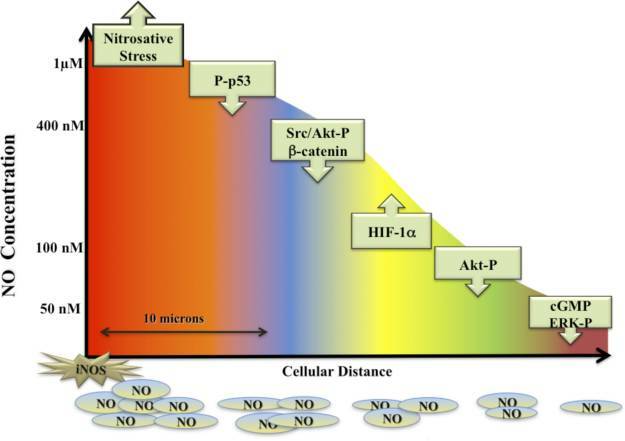 Oxidative and nitrosative stress can also decrease intracellular GSH (reduced form) levels, resulting in a reduced antioxidant capability of the cell. 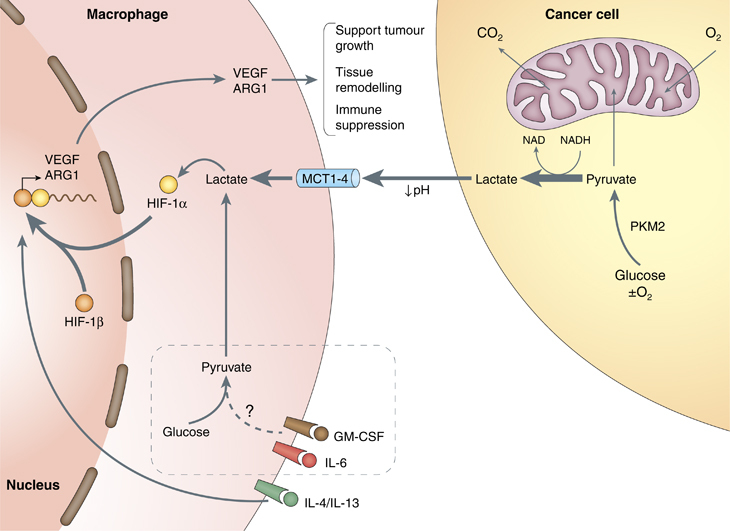 Immune-associated redox pathways regulate other important metabolic cell functions that have the potential for widespread impact on cells, organs, and organisms. These pathways, such as mediated via methionine and polyamines, are critical for DNA stabilization, cell proliferation, and membrane channel activity, all of which are also involved in immune-mediated repair processes. NO/RNS and ROS actively control innate and adaptive immune signaling by participating in induction, maintenance, and/or termination of proinflammatory and anti-inflammatory signaling. As in pathogen eradication, the temporal and spatial concentration profiles of NO are key factors in determining immune-mediated processes. Brune and coworkers (Messmer et al., 1994) first demonstrated that p53 expression was associated with the concentrations of NO that led to apoptosis in macrophages. Subsequent studies linked NO concentration profiles with expression of other key signaling proteins such as HIF-1α and Akt-P (Ridnour et al., 2008; Thomas et al., 2008). Various levels of NO concentrations trigger different pathways and expectedly this concentration-dependent profile varies with distance from the NO source.NO is highly diffucible and this characteristic can result in 1000 fold reduction in concentration within one cell length distance travelled from the source of production. Time course studies have also shown alteration in effects of same levels of NO over time e.g. NO-mediated ERK-P levels initially increased rapidly on exposure to NO donors and then decreased with continued NO exposure (Thomas et al., 2004), however HIF-1α levels remained high as long as NO levels were elevated. Thus some of the important factors that play critical role in NO effects are: distance from source, NO concentrations, duration of exposure, bioavailability of NO, and production/absence of other redox molecules. Fig 4: The effect of steady-state flux of NO on signal transduction mechanisms. 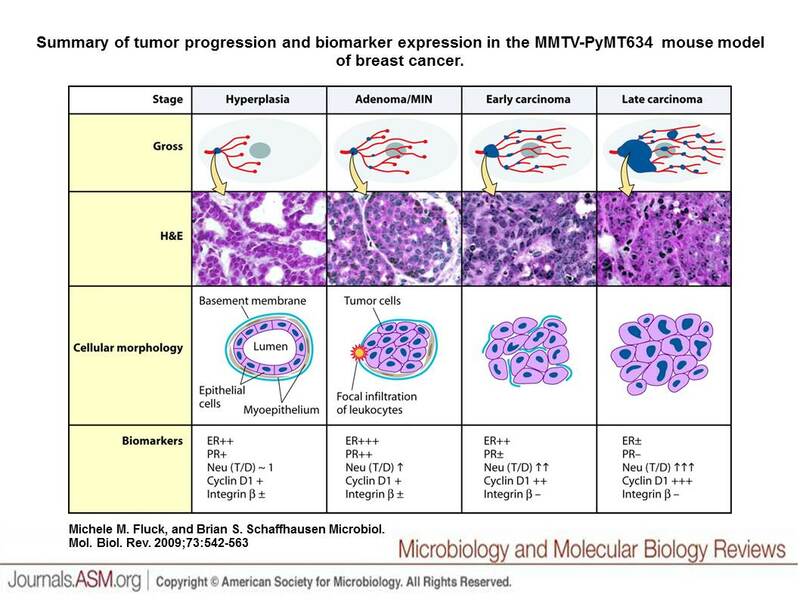 This diagram represents the level of sustained NO that is required to activate specific pathways in tumor cells. Similar effects have been seen on endothelial cells. These data were generated by treating tumor or endothelial cells with the NO donor DETANO (NOC-18) for 24 h and then measuring the appropriate outcome measures (for example, p53 activation). Various concentrations of DETANO that correspond to cellular levels of NO are: 40–60 μM DETANO = 50 nM NO; 80–120 μM DETANO = 100 nM NO; 500 μM DETANO = 400 nM NO; and 1 mM DETANO = 1 μM NO. The diagram represents the effect of diffusion of NO with distance from the point source (an activated murine macrophage producing iNOS) in vitro (Petri dish) generating 1 μM NO or more. Thus, reactants or cells located at a specific distance from the point source (i.e., iNOS, represented by star) would be exposed to a level of NO that governs a specific subset of physiological or pathophysiological reactions. The x-axis represents the different zone of NO-mediated events that is experienced at a specific distance from a source iNOS producing >1 μM. Note: Akt activation is regulated by NO at two different sites and by two different concentration levels of NO. The relationship of NO and immunoregulation has been established on the basis of studies on tumor cell lines or rodent macrophages, which are readily available sources of NO. However in humans the levels of protein expression for NOS enzymes and the immune induction required for such levels of expression are quite different than in rodents (Weinberg, 1998). This difference is most likely due to the human iNOS promotor rather than the activity of iNOS itself. There is a significant mismatch between the promoters of humans and rodents and that is likely to account for the notable differences in the regulation of gene induction between them. The combined data on rodent versus human NO and O2– production strongly suggest that in general, ROS production is a predominant feature of activated human macrophages, neutrophils, and monocytes, and the equivalent murine immune cells generate a combination of O2– and NO and in some cases, favor NO production. These differences may be crucial to understanding how immune responses are regulated in a species-specific manner. This is particularly useful, as pathogen challenges change constantly. 1. Wink, D. A. et al. 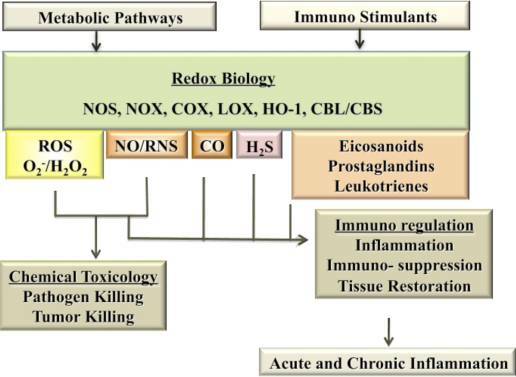 Nitric oxide and redox mechanisms in the immune response. 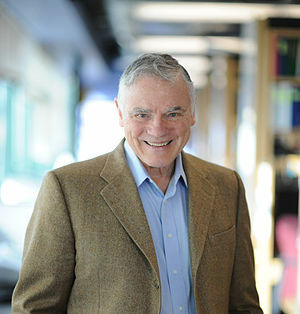 J Leukoc Biol 89, 873–891 (2011). 2. Vásquez-Vivar, J. et al. Tetrahydrobiopterin-dependent inhibition of superoxide generation from neuronal nitric oxide synthase. J. Biol. Chem. 274, 26736–26742 (1999). 3. Messmer, U. K., Ankarcrona, M., Nicotera, P. & Brüne, B. p53 expression in nitric oxide-induced apoptosis. FEBS Lett. 355, 23–26 (1994). 4. Ridnour, L. A. et al. 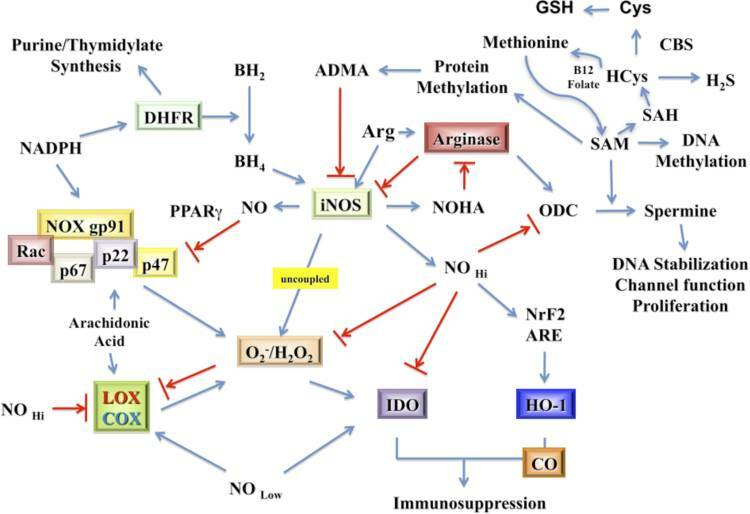 Molecular mechanisms for discrete nitric oxide levels in cancer. Nitric Oxide 19, 73–76 (2008). 5. Thomas, D. D. et al. The chemical biology of nitric oxide: implications in cellular signaling. Free Radic. Biol. Med. 45, 18–31 (2008). 6. Thomas, D. D. et al. Hypoxic inducible factor 1alpha, extracellular signal-regulated kinase, and p53 are regulated by distinct threshold concentrations of nitric oxide. Proc. Natl. Acad. Sci. U.S.A. 101, 8894–8899 (2004). 7. Weinberg, J. B. Nitric oxide production and nitric oxide synthase type 2 expression by human mononuclear phagocytes: a review. Mol. Med. 4, 557–591 (1998). Previous studies have highlighted the role of NO in immunity. It was shown that macrophages released a substance that had antitumor and antipathogen activity and required arginine for its production (Hibbs et al., 1987, 1988). Hibbs and coworkers further strengthened the connection between immunity and NO by demonstrating that IL2 mediated immune activation increased NO levels in patients and promoted tumor eradication in mice (Hibbs et al., 1992; Yim et al., 1995). In 1980s a number of authors showed the direct evidence that macrophages made nitrite, nitrates and nitrosamines. It was also shown that NO generated by macrophages could kill leukemia cells (Stuehr and Nathan, 1989). Collectively these studies along with others demonstrated the important role NO plays in immunity and lay the path for further research in understanding the role of redox molecules in immunity. NO is produced by different forms of nitric oxide synthase (NOS) enzymes such as eNOS (endothelial), iNOS (inducible) and nNOS (neuronal). The constitutive forms of eNOS generally produce NO in short bursts and in calcium dependent manner. The inducible form produces NO for longer durations and is calcium independent. In immunity, iNOS plays a vital role. NO production by iNOS can occur over a wide range of concentrations from as little as nM to as much as µM. 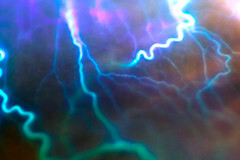 This wide range of NO concentrations provide iNOS with a unique flexibility to be functionally effective in various conditions and micro-environements and thus provide different temporal and concentration profiles of NO, that can be highly efficient in dealing with immune challenges. NO/RNS and ROS are two categories of molecules that bring about immune regulation and ‘killing’ of pathogens. These molecules can perform independently or in combination with each other. NO reacts directly with transition metals in heme or cobalamine, with non-heme iron, or with reactive radicals (Wink and Mitchell, 1998). The last reactivity also imparts it a powerful antioxidant capability. NO can thus act directly as a powerful antioxidant and prevent injury initiated by ROS (Wink et al., 1999). On the other hand, NO does not react directly with thiols or other nucleophiles but requires activation with superoxide to generate RNS. The RNS species then cause nitrosative and oxidative stress (Wink and Mitchell, 1998). The variety of functions achieved by NO can be understood if one looks at certain chemical concepts. NO and NO2 are lipophilic and thus can migrate through cells, thus widening potential target profiles. ONOO-, a RNS, reacts rapidly with CO2 that shortens its half life to <10 ms. The anionic form and short half life limits its mobility across membranes. When NO levels are higher than superoxide levels, the CO2-OONO–intermediate is converted to NO2 and N2O3 and changes the redox profile from an oxidative to a nitrosative microenvironment. The interaction of NO and ROS determines the bioavailability of NO and proximity of RNS generation to superoxide source, thus defining a reaction profile. The ROS also consumes NO to generate NO2 and N2O3 as well as nitrite in certain locations. The combination of these reactions in different micro-environments provides a vast repertoire of reaction profiles for NO/RNS and ROS entities. The phagosome provides an ‘isolated’ environment for the cell to carry out foreign body ‘destruction’. ROS, NO and RNS interact to bring about redox reactions. The concentration of NO in a phagosome can depend on the kind of NOS in the vicinity and its activity and other localised cellular factors. NO and is metabolites such as nitrites and nitrates along with ROS combine forces to kill pathogens in the acidic environment of the phagosome as depicted in the figure 2 below. This diagram depicts the different nitrogen oxide and ROS chemistry that can occur within the phagosome to fight pathogens. 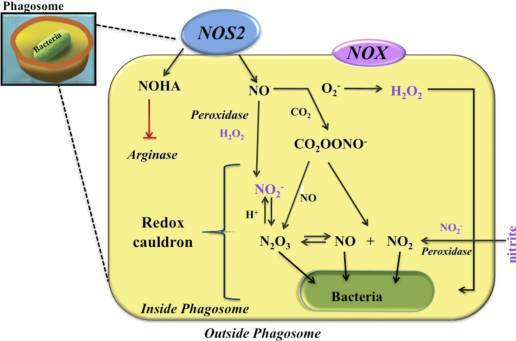 The presence of NOX2 in the phagosomes serves two purposes: one is to focus the nitrite accumulation through scavenging mechanisms, and the second provides peroxide as a source of ROS or FA generation. The nitrite (NO2−) formed in the acidic environment provides nitrosative stress with NO/NO2/N2O3. The combined acidic nature and the ability to form multiple RNS and ROS within the acidic environment of the phagosome provide the immune response with multiple chemical options with which it can combat bacteria. E.coli: It appears to be resistant to individual action of NO/RNS and H2O2 /ROS. However, when combined together, H2O2 plus NO mediate a dramatic, three-log increase in cytotoxicity, as opposed to 50% killing by NO alone or H2O2 alone. This indicates that these bacteria are highly susceptible to their synergistic action. Staphylococcus: The combined presence of NO and peroxide in staphylococcal infections imparts protective effect. However, when these bacteria are first exposed to peroxide and then to NO there is increased toxicity. Hence a sequential exposure to superoxide/ROS and then NO is a potent tool in eradicating staphylococcal bacteria. Mycobacterium tuberculosis: These bacterium are sensitive to NO and RNS, but in this case, NO2 is the toxic species. A phagosome microenvironment consisting of ROS combined with acidic nitrite generates NO2/N2O3/NO, which is essential for pathogen eradication by the alveolar macrophage. Overall, NO has a dual function; it participates directly in killing an organism, and/or it disarms a pathway used by that organism to elude other immune responses. Many human parasites have demonstrated the initiation of the immune response via the induction of iNOS, that then leads to expulsion of the parasite. The parasites include Plasmodia(malaria), Leishmania(leishmaniasis), and Toxoplasma(toxoplasmosis). Severe cases of malaria have been related with increased production of NO. High levels of NO production are however protective in these cases as NO was shown to kill the parasites (Rockett et al., 1991; Gyan et al., 1994). Leishmania is an intracellualr parasite that resides in the mamalian macrophages. NO upregulation via iNOS induction is the primary pathway involved in containing its infestation. A critical aspect of NO metabolism is that NOHA inhibits AG activity, thereby limiting the growth of parasites and bacteria including Leishmania, Trypanosoma, Schistosoma, Helicobacter, Mycobacterium, and Salmonella, and is distinct from the effects of RNS. Toxoplasma gondii is also an intracellular parasite that elicits NO mediated response. INOS knockout mice have shown more severe inflammatory lesions in the CNS that their wild type counterparts, in response to toxoplasma exposure. This indicates the CNS preventative role of iNOS in toxoplasmosis (Silva et al., 2009). Viral replication can be checked by increased production of NO by induction of iNOS (HIV-1, coxsackievirus, influenza A and B, rhino virus, CMV, vaccinia virus, ectromelia virus, human herpesvirus-1, and human parainfluenza virus type 3) (Xu et al., 2006). NO can reduce viral load, reduce latency and reduce viral replication. One of the main mechanisms as to how NO participates in viral eradication involves the nitrosation of critical cysteines within key proteins required for viral infection, transcription, and maturation stages. For example, viral proteases or even the host caspases that contain cysteines in their active site are involved in the maturation of the virus. The nitrosative stress environment produced by iNOS may serve to protect against some viruses by inhibiting viral infectivity, replication, and maturation. Hibbs, J.B., Jr, Taintor, R.R., Vavrin, Z., 1987. Macrophage cytotoxicity: role for L-arginine deiminase and imino nitrogen oxidation to nitrite. Science 235, 473–476. Hibbs, J.B., Jr, Taintor, R.R., Vavrin, Z., Rachlin, E.M., 1988. Nitric oxide: a cytotoxic activated macrophage effector molecule. Biochem. Biophys. Res. Commun. 157, 87–94. Rockett, K.A., Awburn, M.M., Cowden, W.B., Clark, I.A., 1991. Killing of Plasmodium falciparum in vitro by nitric oxide derivatives. Infect Immun 59, 3280–3283. Stuehr, D.J., Nathan, C.F., 1989. Nitric oxide. A macrophage product responsible for cytostasis and respiratory inhibition in tumor target cells. J. Exp. Med. 169, 1543–1555. Wink, D.A., Hines, H.B., Cheng, R.Y.S., Switzer, C.H., Flores-Santana, W., Vitek, M.P., Ridnour, L.A., Colton, C.A., 2011. Nitric oxide and redox mechanisms in the immune response. J Leukoc Biol 89, 873–891. Wink, D.A., Mitchell, J.B., 1998. Chemical biology of nitric oxide: Insights into regulatory, cytotoxic, and cytoprotective mechanisms of nitric oxide. Free Radic. Biol. Med. 25, 434–456. Wink, D.A., Vodovotz, Y., Grisham, M.B., DeGraff, W., Cook, J.C., Pacelli, R., Krishna, M., Mitchell, J.B., 1999. Antioxidant effects of nitric oxide. Meth. Enzymol. 301, 413–424. Xu, W., Zheng, S., Dweik, R.A., Erzurum, S.C., 2006. Role of epithelial nitric oxide in airway viral infection. Free Radic. Biol. Med. 41, 19–28. Yim, C.Y., McGregor, J.R., Kwon, O.D., Bastian, N.R., Rees, M., Mori, M., Hibbs, J.B., Jr, Samlowski, W.E., 1995. Nitric oxide synthesis contributes to IL-2-induced antitumor responses against intraperitoneal Meth A tumor. J. Immunol. 155, 4382–4390.